The Robot Bees Have Landed! …so lock up your flower stamens! The first chapter of my robot bees novel “Apoidea” (go look that up, Latin scholars!) 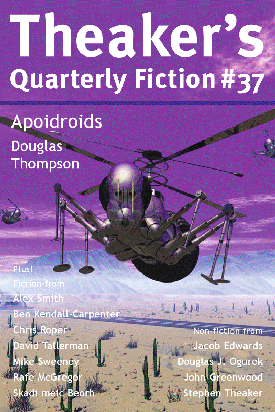 has just appeared in Issue 37 Stephen Theaker’s excellent little magazine Theaker’s Quarterly. Indeed, it is the featured cover story, with artwork image by Howard Watts. You can download the PDF of this issue FREE here, or get the free Kindle or EPUB version as your prefer. If I tell you that one third of all human food production relies on bees for crop pollination, and that in October 2009 the American National Science Foundation awarded Harvard University ten million Dollars to research the creation of robotic bees, then you won’t think this idea (or me) quite so silly as you first thought, eh? Needless to say, in my unreliable hands the rest of the book quickly expands into a full-blown allegorical musing on the true nature of humankind and the meaning of consciousness. Would you expect anything less by now?